Welcome to the most exciting gallery for original art in Scottsdale! On The Edge Gallery features over forty local Arizona artists who display their original fine art and unique gift items in this airy 2,000-square-foot gallery, “on the edge” of the arts district in Old Town Scottsdale. The gallery offers large stunning custom pieces for homeowners and small artistic pieces that travel well. Take a look at our wide variety of Artwork and join us for Events where you’ll meet the featured artists. Downtown Scottsdale just west of the 5th Avenue fountain! Rent our space for your next special event. 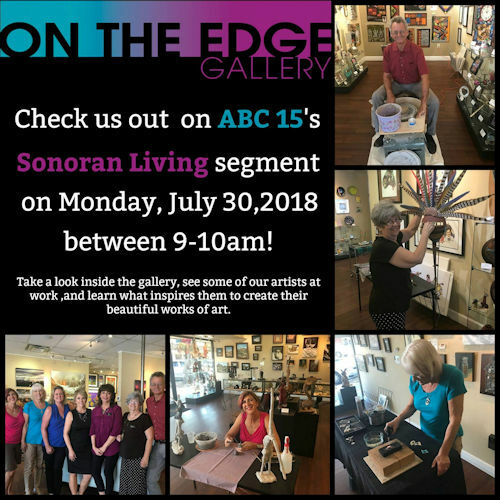 On The Edge has a sister gallery, The Fountain Hills Artists' Gallery. Check it out too!